Over the course of his distinguished career, David McCullough has spoken before Congress, colleges and universities, historical societies, and other esteemed institutions. Now, at a time of self-reflection in America following a bitter election campaign that has left the country divided, McCullough has collected some of his most important speeches in a brief volume designed to identify important principles and characteristics that are particularly American. It's college commencment day, most of the time. On May 15, 2003, David McCullough presented "The Course of Human Events" as The 2003 Jefferson Lecture in the Humanities in Washington, DC. The Jefferson Lecture is a tribute to McCullough's lifetime investigation of history. At the end of the last century, Johnstown, Pennsylvania, was a booming coal-and-steel town filled with hardworking families striving for a piece of the nation's burgeoning industrial prosperity. In the mountains above Johnstown, an old earth dam had been hastily rebuilt to create a lake for an exclusive summer resort patronized by the tycoons of that same industrial prosperity, among them Andrew Carnegie, Henry Clay Frick, and Andrew Mellon. 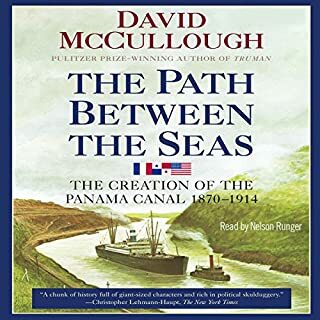 Pulitzer Prize-winning historian David McCullough rediscovers an important and dramatic chapter in the American story - the settling of the Northwest Territory by dauntless pioneers who overcame incredible hardships to build a community based on ideals that would come to define our country. Gifted storyteller Winston Groom, the best-selling author of Forrest Gump, has written the fascinating story of three extraordinary heroes who defined aviation during the great age of flight: Charles Lindbergh, Eddie Rickenbacker, and Jimmy Doolittle. These cleverly interwoven tales of their heart-stopping adventures take us from the feats of World War I through the heroism of World War II and beyond, including daring military raids and survival at sea, and will appeal to fans of Unbroken, The Greatest Generation, and Flyboys. 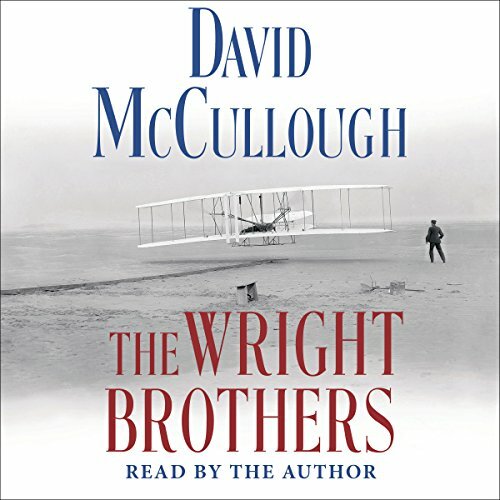 David McCullough's The Wright Brothers is a detailed biographical account of Wilbur and Orville Wright and their journey and achievements in the early, burgeoning world of human aviation. This Instaread Key Takeaways & Analysis of The Wright Brothers includes an overview of the book, an introduction to the important people in the book, and key takeaways and analysis of key takeaways. Two-time winner of the Pulitzer Prize David McCullough tells the dramatic story behind the story about the courageous brothers who taught the world how to fly: Wilbur and Orville Wright. On December 17, 1903, at Kitty Hawk, North Carolina, Wilbur and Orville Wright's Wright Flyer became the first powered, heavier-than-air machine to achieve controlled, sustained flight with a pilot aboard. The Age of Flight had begun. How did they do it? And why? David McCullough tells the extraordinary and truly American story of the two brothers who changed the world. Sons of an itinerant preacher and a mother who died young, Wilbur and Orville Wright grew up on a small sidestreet in Dayton, Ohio, in a house that lacked indoor plumbing and electricity but was filled with books and a love of learning. The brothers ran a bicycle shop that allowed them to earn enough money to pursue their mission in life: flight. In the 1890s flying was beginning to advance beyond the glider stage, but there were major technical challenges the Wrights were determined to solve. They traveled to North Carolina's remote Outer Banks to test their plane because there they found three indispensable conditions: constant winds, soft surfaces for landings, and privacy. Flying was exceedingly dangerous; the Wrights risked their lives every time they flew in the years that followed. Orville nearly died in a crash in 1908 but was nursed back to health by his sister, Katharine - an unsung and important part of the brothers' success and of McCullough's book. Despite their achievement the Wrights could not convince the US government to take an interest in their plane until after they demonstrated its success in France, where the government instantly understood the importance of their achievement. Now, in this revelatory book, master historian David McCullough draws on nearly 1,000 letters of family correspondence plus diaries, notebooks, and family scrapbooks in the Library of Congress to tell the full story of the Wright brothers and their heroic achievement. What did you love best about The Wright Brothers? I am so surprised by how much I disliked this book. The narration was my biggest stumbling block. This is a perfect example of the problems that can happen when the author narrates his own book. 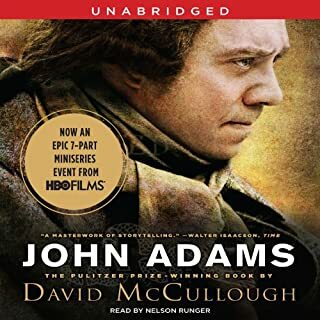 I have loved many of McCullough's other books--with particular favorites being John Adams and Truman. However, these were both books that the author did not narrate himself. If you are a McCullough fan be sure to listen to the sample first. Also, be aware for me it wasn't just the narration, I thought that the writing sounded tired and worn out as well. The whole experience was slow, tiresome and really sad. Can't recommend. I feel badly not giving the book a more positive review. Unlike many of McCullough's other biographies, I was disappointed in the lack of depth in this book as well as the vast parts of the Wright Brothers' lives that were given minimal treatment, if any. This book focuses on the incredibly strong personal character of the Wright brothers and their family, and highlights the interesting Victorian times that formed their characters. Much detail is paid to the airplane and they flying, as should be. I also appreciated the strong emphasis on the Wright's family relationships as exhibited through their letters. I enjoyed much of the anecdotal background material. The examples of the difficulties in getting to Kitty Hawk and in communicating from there, for example. I was quite surprised at the degree of positive spin that is represented in this book. The Wrights could be much more small and vindictive (for example in their patent fights) than this book relates. Not much attention is paid to the business side of their aviation business: How they made their money, their arrangements for licensing their designs and how they made money in the licensing, their patent fights and the poor relationship with Glenn Curtiss. For example, McCullough spends a reasonable amount of effort discussing the context of JP Langley's failed exploits on the Potomac. But as an equally important matter of context, the author barely touches Alexander Bell's Aerial Experiment Association (AEA), Curtiss' experiments and innovations in aviation, or the ensuing patent wars which consumed the Wright Company and Curtiss for many years. In omitting these important factors in the Wright's lives, the opportunity to relate motivations and the way they handled these issues are also lost. 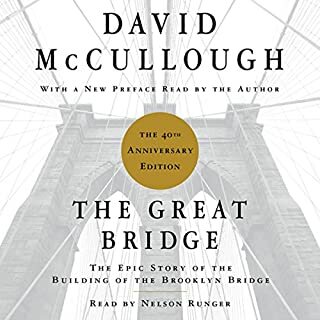 I listened to McCullough's book about the Brooklyn Bridge and wasn't just wild about it because of the mind-numbing technical detail which didn't make much sense without illustrations and almost deleted this book from my list, but I'm glad I didn't. McCullough did a terrific job of giving a picture of the earliest days of aviation, and bringing the Wright brothers to life. While this may not be the stunning masterpiece of his past books, it is nonetheless an excellent historical work. McCullough masterfully describes the personalities of the characters...and his voice was perfect for a story detailing a Midwest family...as someone else said, "a salt of the earth voice"....it was like listening to 10 hours of Walter Cronkite. 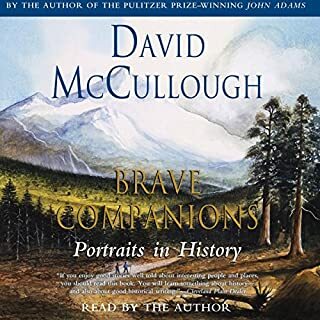 There is a quality in the writing of David McCullough that combines careful research with vivid characterization and brilliant scene setting and adds to those things deep empathy so that the readers or listeners care about the people about whom he writes. This book is interesting, moving, and satisfying in its depiction of the times in which the Wrights lived and the people with whom they lived and worked. There is something compelling in hearing the author read his own words. His voice is on the thin side because of his age, but his own emotional involvement with the subject draws me into the story in an irresistible fashion. Listening to this book provides a wonderfully memorable experience. Highly recommended! I had not read anything about the Wright Brothers since high school. When I saw that one of my favorite authors David McCullough had a new book out I rushed to buy it. I am amazed at how much scientific study and experimentation the brothers did even before they started to build their craft. McCullough goes into depth about their early life. He provides a detailed glimpse of the Wright family including Sister Katharine. Wilbur and Orville Wright in 1903, off the outer banks of North Carolina at Kitty Hauk were the first to pilot a machine that took off under its own power into the air in full flight and sailed forward with no loss of speed and landed at a point distant from its start. In Dayton their practice field was just a cow field so they had to learn to turn the plane and fly in circles, they were the first to do this flying a motorized plane. Charlie Taylor worked for the brothers in their bicycle shop and he build their lightweight engine for the Wright Flyer. I find it interesting that at the same time as the Wright Brother there was also George Eastman, Isaac M. Singer, Edwin Land, Henry Ford and other great inventors, it was the high point of the age of invention. McCullough did an enormous amount of research into the family correspondence, diaries, and lab notes to prepare for writing this book. The book is well written, another great book form the author. The author narrated his own book. 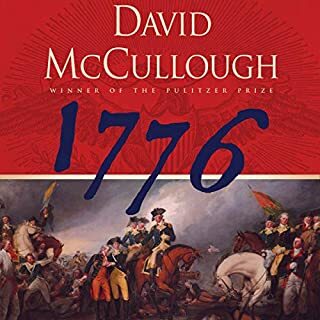 I felt this was a good biography, but suffered in comparison to much stronger works by McCullough such as Truman and 1776. 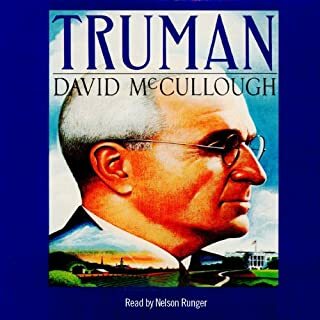 McCullough is still a great narrator, but his voice sounds tired in this recording. When history regains the breath of life. If you could sum up The Wright Brothers in three words, what would they be? What was one of the most memorable moments of The Wright Brothers? Realizing what it was like to see men fly for the first time ever. What about David McCullough’s performance did you like? He has a down-to-earth quality to his voice. He's seems to be from their hometown. It's as if he knows the Wright Brothers personally. I am always happy when I get a book that brings life to characters from history who have my whole life been just a static list of accomplishments. I found myself invested in the Wright Brother's story from start to finish. The ending was a sentimental "Ah!" for me. Brought tears to my eyes. I love this book.